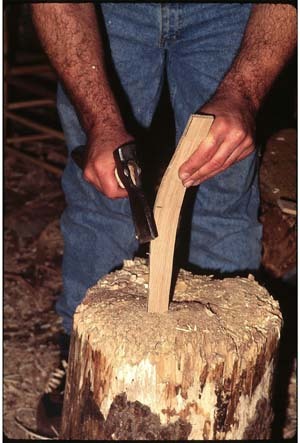 The first step in this old-time way of making chairs is to go out into the woods and find a good tree. 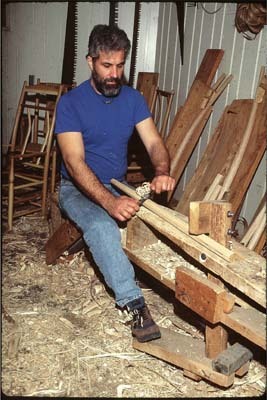 For the frames of my chairs I use mostly White Oak and Hickory. I look for tall straight trees with a diameter at the base of 16" or larger. The trees need to have good healthy growth rings and not to many knots. Picking out a good tree is very important and it takes a lot of practice to know what you are looking for and where to find it. After felling a tree I do not take it to the saw mill. Instead, I split out the pieces I need from the bole, the first cut, of the tree. 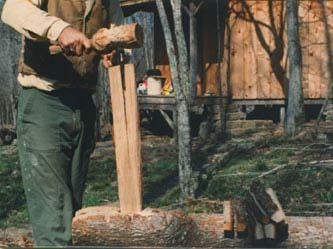 A maul, wedges, and froe are used to do the splitting and most of the work is done right where I drop the tree. 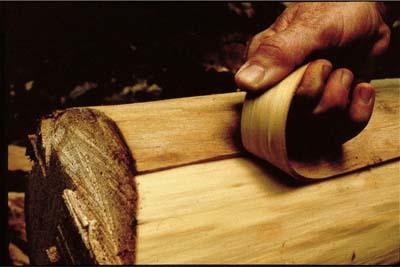 The split-out pieces are shaped by eye with a draw-knife while the wood is still green. The green wood and straight grain works easily with sharp tools. These pieces are very strong and flexible because I'm always following the grain (it also makes the chairs prettier, I think). The joints are all made by hand with a foot-lathe, brace n' bit, and chisels - taking my time to make sure that they fit well. I assemble the chairs while the wood in the legs is still a little bit green, but I dry the spokes in a kiln. If done right the joints will never come loose because the green wood of the legs will dry and shrink around the dry wood of the spokes. 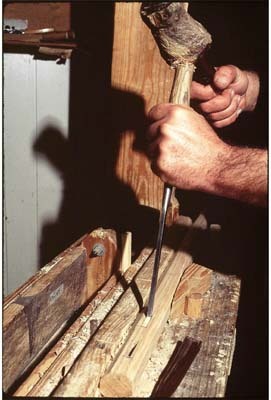 The other joints are held in place with Walnut dowels, wedges, or square headed pegs. I never use nails, screws, or other metal fasteners in my chairs. 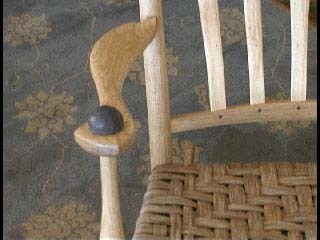 Most of the rocking chairs I make have seats woven out of Hickory bark. 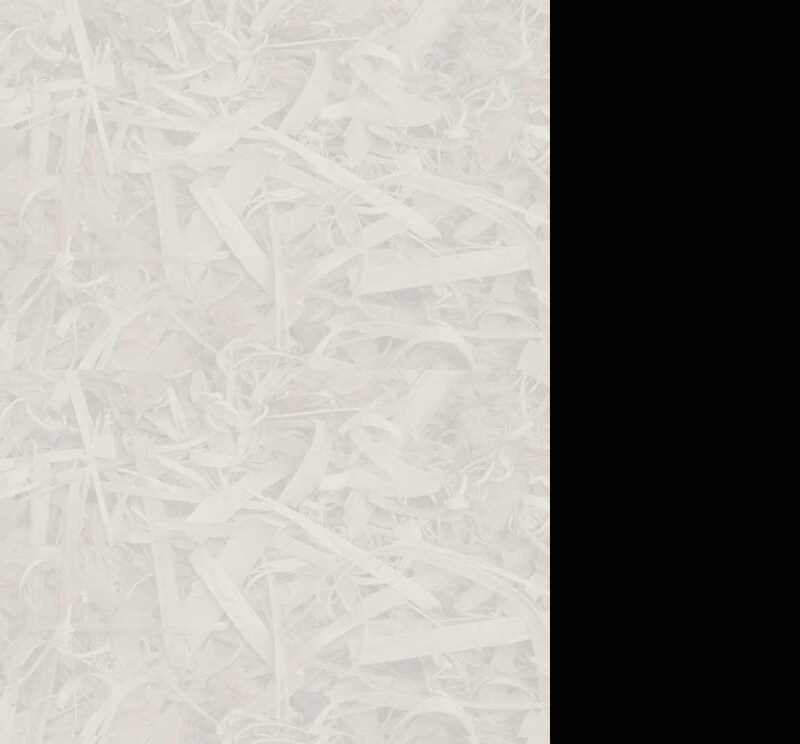 This material comes from the inner bark of small Hickory trees and is harvested in the spring time when the sap is up. Hickory bark is just about indestructible and with use increases in beauty, becoming smooth and shinny over time. A good hickory bark seat can last well over fifty years; I saw one once that was almost 150 years old and it was still in reasonably good shape. The frames of my chairs are finished with 100% Tung oil, this is a non-toxic penetrating oil that is made from the seed of the Tung tree. This finish is very easy to take care of in that the oil can be reapplied to clean and polish the chair or even used fill in scratches. A good Tung oil finish is very durable, will not water spot, and only improves with age as the wood develops a rich patina. This design is the result of my almost 20 years of chair making experience. The curves and angles of the chair function to hold your body in a healthy posture and a leisurely recline, this combined with a custom fit make my rocking chairs very comfortable.